The exposure to business administration is one unique factor that makes students from TUM Asia stand out from among the crowd. 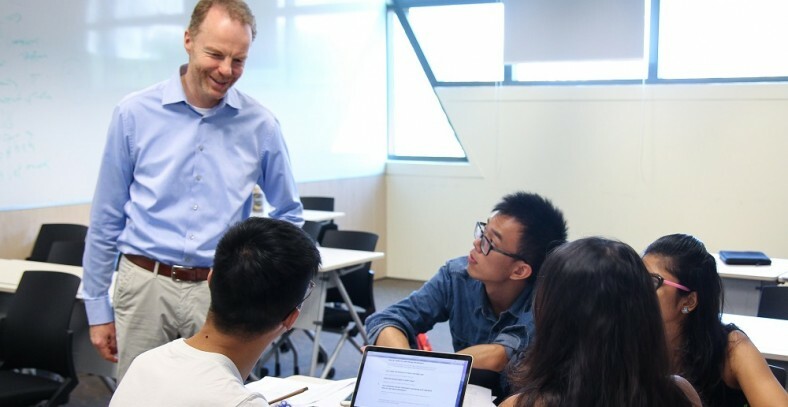 We recently had the opportunity to interview Dr. Franck Boeckelmann from Wacker Chemie, a guest lecturer teaching the Chemical Business Administration module in the Master of Science in Industrial Chemistry programme since 2002, on his thoughts about teaching a business subject to scientists and engineers. Hi Dr. Boeckelmann, you have been working for many years at Wacker Chemie. Can you tell us what is your role at Wacker Chemie? Dr. Boeckelmann: I started working with Wacker Chemie AG in 1989. I held leading positions in different working fields such as controlling and planning, internal audit, and also abroad as the Chief Financial Officer in Japan. My current position is Chief Compliance Officer. How did you end up teaching in the Industrial Chemistry programme at TUM Asia? Dr. Boeckelmann: During my career, I have always enjoyed training managers and employees and I discovered my passion to teach students. I have been teaching in the programme in TUM Asia ever since it started back in 2002. Since then, I have also started teaching a similar programme in 2007, which is catered more for doctoral students at TUM. As a senior executive figure in a leading chemical company, why would you think that business administration is an important subject to understand, for engineers? Dr. Boeckelmann: As students venture into the working world, they will eventually climb up the working ladder. All managerial jobs will have to deal with economical thinking and that requires business administration. It is important to think ahead and to be able to face the challenges a business can have. Engineers should have at least basic economical knowledge and managerial skills, and that will prepare them for advancements in their careers. Can you tell us more about the module you teach at TUM Asia? Dr. Boeckelmann: As these students are studying chemistry – a natural science – I want to impart to them a comprehensive overview of economical thinking and inter-dependencies. My curriculum includes accounting and balance sheets, controlling, marketing and finance among others. Such areas are important from my perspective as it allows the students to witness how everything is links up through the case studies that I share with them. Lastly, how do you think that this business-related understanding will impact TUM Asia graduates who may work in a non-business department? Dr. Boeckelmann: The students will learn, through my module, how to discern and understand industrial capital expenditures. Through this, they will learn more about the internal business operations of a chemical company, such as understanding how those companies are financed and how their products are marketed.